Don't miss Hallie Jackson's exclusive behind-the-scenes access to Marco Rubio as the candidate campaigned on Tuesday. 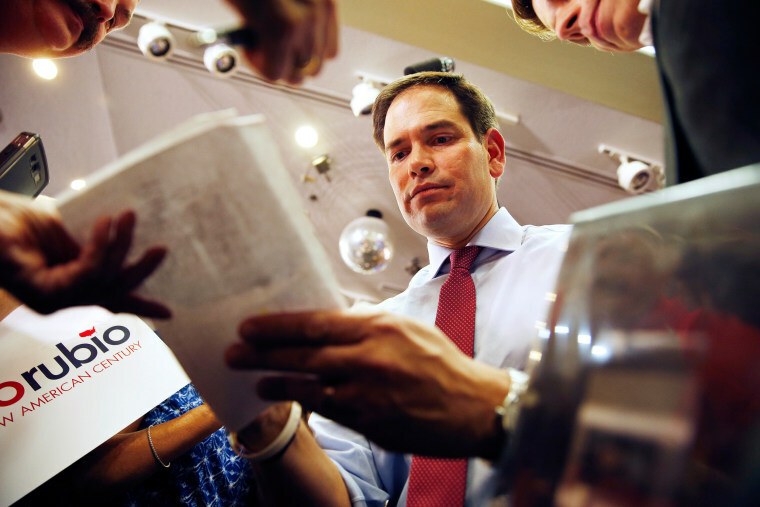 Rubio spoke about his campaign routines, his favorite music and missing his kids on the road. And he defended his immigration stance, telling Jackson: "I personally do not believe that it's good for America to have millions of people permanently living here who can never become Americans, who want to be Americans, who love America, but just can't become Americans." MORE: "I recognize that my position is not a majority position in my party — maybe not even a majority position in large parts of America." Msnbc.com's Benjy Sarlin has a good view of the possible twists and turns that the GOP campaign may take. The battle between Cruz and Rubio continues to rage, exposing long-standing fault lines in the GOP on national security. The increasingly hawkish rhetoric from the GOP could alienate swing voters, though, notes the Washington Post. CRUZ: "Senator Ted Cruz, facing the most aggressive effort yet to sully his reputation with conservatives, absorbed a flood of attacks Wednesday from Senator Marco Rubio over immigration policy and national security, an offensive aimed at halting Mr. Cruz’s rise among Tea Party and evangelical voters," notes the New York Times. He's launching a seven day tour of Super Tuesday states. This was a pretty brutal interview on FOX re: his immigration stance. CLINTON: In Iowa, she said: "Don’t send the American military any place we shouldn’t send them, to do anything that is not appropriate." SANDERS: Alex Seitz-Wald and Andrea Mitchell report that the powerful Communications Workers of America union is set to endorse Bernie Sanders today. TRUMP: He's threatening -- again -- to sit out the next debate. OBAMA AGENDA: Another email scandal? Breaking this morning: Defense Secretary Ash Carter Used Personal Email For Work. MORE: "Pentagon spokesman Peter Cook said Carter believed it "was a mistake," adding in a statement that the defense secretary had stopped such use of his personal email." The fallout from the Fed decision, from the Wall Street Journal: "Global stocks surged on Thursday as investors around the world reacted positively to the Federal Reserve’s decision to raise interest rates and the confidence in the U.S. economy that underpinned the move." BALTIMORE: Via the Baltimore Sun: "A judge declared a mistrial Wednesday in the case of Baltimore Police Officer William G. Porter after jurors said they had failed to reach an agreement on any of the charges against him in the death of Freddie Gray. The decision, which came a day after jurors told Baltimore Circuit Judge Barry Williams they were deadlocked, frustrated activists who had watched the first trial in Gray's death closely. Outside the downtown courtroom, city officials and community leaders pleaded for calm, and authorities reported two arrests, but no violence or serious disruptions." CONGRESS: What’s in the $1.1 trillion spending bill? The AP: "Republicans are ready to whip a year-end tax-cut compromise through the House as Congress prepares to finish 2015 in a flurry of accomplishment that belies the partisan collisions sure to dominate the coming election year. Though House Minority Leader Nancy Pelosi was leading a Democratic charge against the tax measure, GOP leaders seemed certain to push it through the chamber Thursday. That would set the stage for House passage Friday of a companion bill providing $1.1 trillion to finance government in 2016, leaving only Senate action before the 2,200-page bundle is shipped to President Barack Obama for his promised signature." The Washington Post: "The 2,009-page spending legislation and a companion 233-page tax bill are the final product of months of sparring both inside and between the two parties. They also represent the first major negotiation conducted by new House Speaker Paul D. Ryan (R-Wis.), who immediately sought to distance himself from the proposed legislation Wednesday, even as he embraced the importance of compromise." What's in the huge $1.1 trillion spending bill? Roll Call outlines the winners and losers. From the Wall Street Journal: "Congress is headed toward imposing new travel restrictions on foreigners who have traveled to countries such as Iran, Syria and Iraq in the last five years, tapping into public anxiety following the Paris and California terror attacks. The restrictions would apply to citizens of 38 countries, mostly in Europe and Asia, who enjoy special travel privileges allowing them to come to the U.S. without a visa." *** Thursday’s “Andrea Mitchell Reports” line-up: Joining NBC’s Andrea Mitchell at 12p ET – Baltimore Mayor Stephanie Rawlings-Blake, Former U.S. Ambassador to Russia Michael McFaul, Malcolm Nance – Executive Director of the Terror Asymmetrics Projects, the Washington Post’s David Ignatius, the Wall Street Journal’s Jeanne Cummings, and NBC’s Richard Engel, Keir Simmons, Pete Williams, Jim Miklaszewski and MSNBC’s Ari Melber.